The best thing that happened today was probably Russell Martin getting kicked out of the game while on the injured list. It was that kind of game. The Dodgers started 2019 with a record 8-2, but are now 8-8 and suddenly the season feels so much different. The wonderful feeling of reversal of their previous seasons’ slow start fortunes has been erased. In tonight’s contest, the bats went to sleep and the Dodgers lost by a score of 4-1. Davies was certainly aided by the wide strike zone of Jeremie Rehak and framing by Yasmani Grandal. Two of his six strikeouts came looking, one of which came with two runners on base, which ended up being the Dodgers’ last real look at the game. 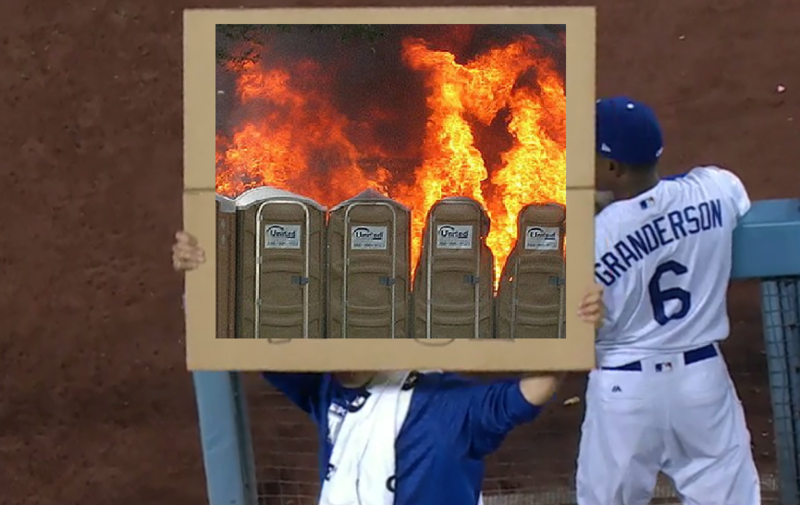 Still, it’s hard to complain about Grandal framing after being on the positive side of those calls for so long. The Dodgers’ bullpen was tasked with going all nine innings tonight, and for the most part they did a decent job. Caleb Ferguson took the ball first and, oddly, he threw 47 fastballs in his 51 pitches. Ferguson came out throwing hard, sitting 95 and touching 97 in the first inning, a welcome sign after starting the season down on velocity. However, he surrendered a home run, two walks, and four hits in 2-2/3 innings as his velocity faded back into the lower 90s by the end of the outing. Everything he threw had a ton of movement, but struggled with his release point at times. Orlando Arcia got him for a home run, and his control faltered by the end of the 1-1/3 inning stint. Yimi Garcia inherited Santana’s bases loaded jam, but was able to stop the bleeding to keep the game close. The bullpen did its job throughout the rest of the game with Garcia, Scott Alexander, Pedro Baez, and Jaime Schultz combining to hold the Brewers scoreless over the final five innings pitched. Ultimately, the Dodgers’ bats wasted the good bullpen performance, going 0 for their last 14 to end the game quietly. The Dodgers will look to stop the bleeding (again) tomorrow afternoon at 1:10 PDT. Jhoulys Chacin will start for the Brewers. For the Dodgers, Ross Stripling will desperately try to give the exhausted bullpen a long outing, something they’ve been looking for for almost a week.